What do you get when you put spiders on the big screen? Movie magic! Whether you are petrified of these eight-legged creepy crawlies, or marvel at their ingenuity and abilities; Hollywood has capitalized on the raw emotion spiders evoke in audiences young and old. This has led to some of the most memorable, must watch spider scenes in the history of cinema. One of the most brilliant movies of my childhood was Raiders of the Lost Ark; with one of the most memorable movie scenes as well. It’s one of many that just stick with you. This scene will make you almost lose consciousness for a few reasons. To begin with, how do that many tarantulas end up on both of their backs? They did walk through a giant web, but tarantulas don’t live in webs. How’d they get on their backs? Secondly, the spiders on Indy’s back are terrifying, but when the guide turns around and seems to have twice the amount that Indy did… Oh my! When it comes to memorable spider scenes, how could we leave out the scene in which Spiderman actually becomes the web-slinging hero we know him to be!?! The tougher decision was choosing between the 2002 version with Tobey Maguire, or the more recent 2012 installment with Andrew Garfield. Sticking with the theme of eight, like eight legs, what’s more fitting for our next selection than 8 Legged Freaks? Giant spiders attack a small Arizona town. Assortments of horrific venomous spiders get exposed to a toxic chemical that causes them to develop and grow to mammoth proportions. Really bad CGI, and blood and guts galore, make this a cult classic. Since there are just too many spider kill scenes to recount, enjoy this very bloody compilation of spider scenes from the film. I had to throw in this particular spider scene in, just because I remember it made me literally laugh-out-loud the first time I saw it! Not every spider scene on our list has to be creepy! How many of you have ever had a spider tug at your heart strings? Have you ever had that nightmare where you’re trapped in a spiderweb, as a giant spider creeps slowly toward you? Well, the spider scene in Krull is your nightmare personified! This spider scene is always good for a laugh! In one of the most memorable scenes in Harry Potter and The Chamber of Secrets, or perhaps a scene you wish you could forget if you happen to be petrified of spiders, Harry goes to Aragog (the giant talking spider) to prove Hagrid didn’t open the chamber of secrets. Aragog tells his kids (the hoards of other spiders) that he will not deny them fresh meat, and to indulge! Watch as the spiders rain down on Harry and Ron. *Warning- Language Not Suitable For Work. One of the most horrific spider scenes ever shot, and a favorite of horror enthusiasts everywhere, is the spider pharmacy scene in Stephen King’s The Mist. Watch as a trapped group of survivalists stumble upon a huge web. Inside the web, they discover a poor schmuck trapped in the web with baby spiders hatching and ripping him apart from the inside. It gets worse! Hoards of spiders, which act more like and hungry pack of wolves, unleash hell on the group. The scene truly is something out of a nightmare! Meet Shelob, the giant spider! Movie makers can sure make one creepy, hellacious, giant spider… The kind that moves fast, has foot-long fangs, plenty of eyes, hair, and even a stinger. Watch the spider get the best of Frodo, only to have Sam save the day! 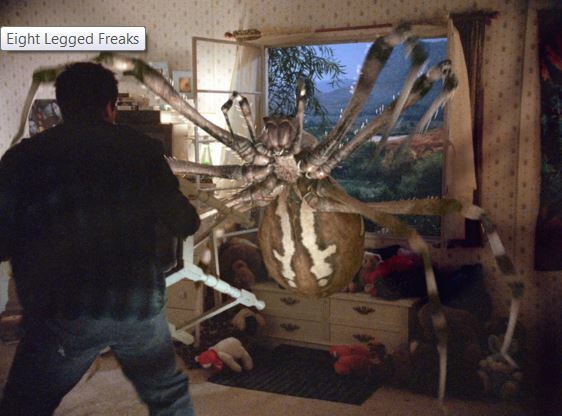 Just when you thought Harry and Marv have had enough in Home Alone; chasing Kevin through his torturous “funhouse,” Kevin still has one more surprise for the two wet bandits… A giant spider! Watch as Harry (Joe Pesci) takes a spider to the face and Marv (Daniel Stern) takes a crowbar to the chest, all while Kevin makes his final escape! The number one most memorable must watch spider scenes in all of cinema is from none other than Arachnophobia. Truthfully, you could probably select the whole movie as a memorable spider scene, as movie stole the heart of millions of film lovers when it got released in 1990. The movie is an accurate depiction of what truly makes spiders scary to so many. A recently discovered spider from Venezuela is accidentally brought to a small American town, breeding with local spiders. This creates a new race of poisonous spiders that begin killing off town residents one at a time. Jeff Daniels overcomes his fear of spiders as he battles them to their death. John Goodman makes for one heck of an exterminator. The creep-you-out-of-your-pants scene is at the end, when all the spiders leave the nest and infest Jeff Daniels’ house– spreading all over the walls, the door, the TV, spewing out of the sink drain, up under the doorknobs, under the doors, hanging down from the ceiling. In the film, they’re so poisonous that one bite will kill you in five seconds. Daniels pitches over the stairs and crashes into the basement, where Big Mama and Daddy are nesting. I also included a few other very memorable scenes. Well there you have it! The top ten must watch spider scenes from movies. There were so many memorable scenes to choose from. Some honorable mentions include: Arachnid, Coraline, Kingdom of the Spiders, The Thing, Something Wicked This Way Comes, Nothing to Lose, Son of Godzilla, James and the Giant Peach, The Incredible Shrinking Man, The Beyond, Dr. No, Tarantula, and This Night I Will Possess Your Corpse. What did you think of the top ten must watch spider scenes from movies?